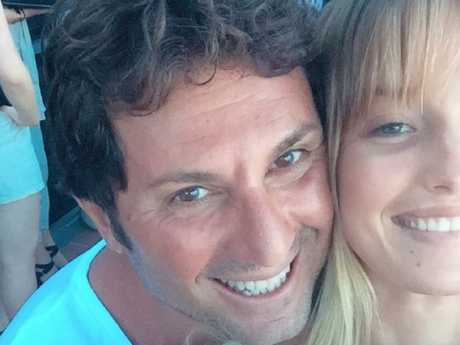 MARRIED At First Sight bride Gabrielle Bartlett and Nasser Sultan called it quits last night on the show - now, she has poured her heart out at the same time he has shown off his "new wife." Bartlett wrote a lengthy post on Instagram overnight, telling fans of the Channel 9 program how the experience had changed her life overnight. Nasser with "new wife" Leah. At the same time, Sultan shared a photograph of a stunning blonde kissing him on the cheek, with the caption "new wife." It is unclear whether he is actually dating Leah Valentine Bennett, who spent a night out in Sydney with Sultan and fellow TV groom Ryan Gallagher. Bartlett appeared more heartbroken following their separation, which aired last night. She wrote "this girl has gotta keep moving" in a long social media post. Leah Bennett is a bikini babe from Sydney. "This experience has changed me forever and indeed for the better," she wrote. "To the entire #mafs team, I will always be grateful that you chose me from the thousands of applications to be a part of this amazingly raw, vulnerable and amazing journey. "And to you, yes Mr you ... the gorgeous, masculine, kind hearted man of my equal that I just haven't met yet. "I may not have found you yet but I'm sure one day we'll walk into a friends BBQ with you doing your thing, wheeling our Esky for me while I carry our salad. "I'm still looking for you so please keep searching to find me. As Van Morrison says - The best is yet to come. Sending rays and rays of love." Bartlett delivered a bombshell earlier this month, revealing exclusively to Confidential that she would rather have been matched with the show's "cheating" villain Dean Wells than Sultan. The 44-year-old mother-of-one shocked fans during last night's episode of the reality show by committing to stay with Sultan to prove that he wasn't "a monumental waste of my time". "I would have preferred to be in Tracey's situation than mine because at least Dean participated in the relationship," she said at the time. "It was uncharted territory for all of us but the basis when you walk down the aisle is someone there wanting to find love." Leah Bennett and Nasser Sultan. Leah Bennett has more than 7,000 followers on Instagram.